Weather changes can also affect your skin. Seasonal and climates changing leads to skin condition changing that can cause breakouts. Also sun is responsible for causing them so don’t forget to put on your sunscreen with UV blocker and oil-free. Birth control pills. Usually pills affect estrogen and progesterone levels which can clear some women’s skin but can cause breakouts in others. If you know this is the reason, contact your gynecologist and ask for new pills. Hair. Have you noticed that if you have bangs your forehead skin starts to change? That’s because your hair or better your hair products can block pores which after weeks become a pimple. Oily hair are worse because feed acne causing bacteria. To avoid this, keep pores clear by swiping skin near hairline with an antibacterial product. Toothpaste. Have you heard that toothpaste help to heal a pimple? That’s a myth. Skin around the corners of mouth can react to certain like fluoride or whitening agents, and create breakouts. If that’s the reason, replace your toothpaste with a fluoride-free and non-whitening one. Your skin is sensitive to those agents so be aware of them. 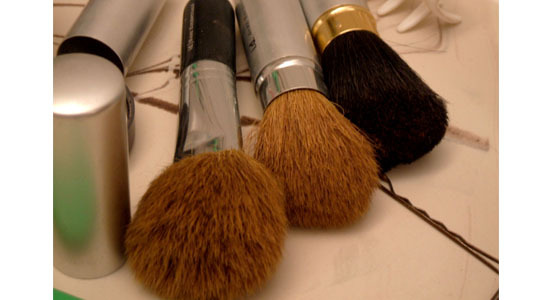 Makeup brushes can cause pimples too, if they aren’t clean. Bacteria and impurities collected there can affect your skin so make sure to keep clean your makeup brushes every day or at least once a week with soap and water. Makeup products. Topical creams, makeup or lotions can contain minerals that cause pore clogging. Go for non-comedogenic products which are oil-free and doesn’t affect skin complexion. Skipping washing face before bed. It’s a crime to go sleeping without removing your makeup. Okay you are tired but at least use a cleansing wipe. Thick oil based primers and foundation are the worst enemy of skin which cause dullness, breakouts and acne and prevent skin to renew itself naturally. Pores are clogged and skin is exposed to free radicals that break down skin collagen. Your workout. It’s not about the act of exercising it’s about the mat you are using. It is shared with others, maybe where you put your head they had their feet. Sweat, bacteria and oil can cause breakouts. The solution? Use a personal mat and place a clean towel every time. After a workout wash your face with salicylic acid products to keep pores clean. Stress. When you are over stressed, androgen, cortisol and adrenal steroids levels are higher which lead to breakouts. Stress is impossible to be avoided completely, but you can control it by having enough sleep, meditating, relaxing techniques or doing something you really enjoy. Nutrition. You are what you eat, that’s so true. There are friendly skin foods and others that better being avoided like: caffeine, dairy, sugar, peanuts, and sodas. Instead go for dark leafy greens, salmon rich in omega-3, green tea or other foods rich in antioxidants. If you know exactly what cause you imperfections, it’s easier to treat and prevent them. Take care of your skin regularly and seriously every day and you will notice the difference.